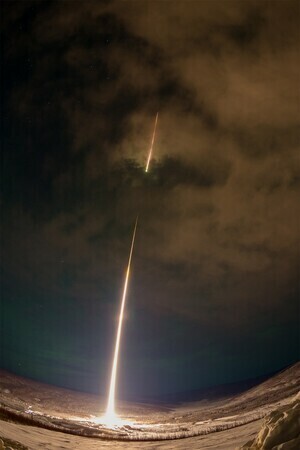 An experimental probe launched by NASA from Alaska yesterday – off to measure nitric oxide in the polar sky. Image by Jamie Adkins of the Poker Flat Research Range. Posted in Science/Tech and tagged launch, rocket at 12:28 pm on January 31, 2017 by Broadsheet. is there room on the broom for a dog like me? Ah, I see I’m not the only one who knows it off by heart. Unfortunately Trump just barred NASA from all climate change research/activity, so won’t be seeing many more of these missions.